In a post, Mark Zuckerberg on January 11th, Facebook announced some major changes in direction that have us social media professionals buzzing. If there is one thing that has been consistent with Facebook over the last ten years, it’s the constant changes. For the CEO to make such an announcement himself is quite rare though. It is impossible to read all the pieces of content out there that are trying to dissect what is happening. I know there are many more, please share your favourites in the comments. I invite you to listen and tell me what you think. There is no doubt that Facebook has become part of our lives. We build it into our daily routines; it helps connect us with our friends, our community and our causes much more than ever before. Since Facebook was launched in 2004, we have seen many changes in what the platform does, and of course, its functionality. Even before I started advising small business owners on the use of social media tools in 2010 “everyone” was up in arms every time the platform made a change to any functionality or design. In fact, a big part of Facebook’s success is its ability to adapt to the changes in its user’s behaviour and also shape this behaviour. Ever since Facebook grew so large that it felt the need to sort what we see in our newsfeed via an algorithm, users have been complaining that we were losing what we originally signed up for – connecting with our friends and family. Granted, the social media platform has become much more to us since then. The human connections are still the most valuable part of any social network for most. But, ever since Facebook decided to become a publicly traded company, it became increasingly important to make money and show us as many ads as we would tolerate. Facebook has said before that it has a real problem with the fact that the users create less and less original content. Social Media marketers and news outlets have refined the best ways to manipulate what we see. Even very frequent algorithm changes don’t help for long. But if you look at the past changes to Facebook’s algorithm you can see a pattern that leads to this latest announcement. Every update was limiting unnatural tactics that tried to trick us or the algorithm and was fostering real person interaction. “The research shows that when we use social media to connect with people we care about, it can be good for our well-being. We can feel more connected and less lonely, and that correlates with long term measures of happiness and health. On the other hand, passively reading articles or watching videos — even if they’re entertaining or informative — may not be as good. Social media and mobile technology is a greater interruption of our societies than the printing press or even Radio or TV ever were. While Social Media is more than Facebook, its size and importance, at least in North America, give the network a big responsibility. What makes or breaks an online platform is the fact that people use it. All ways to inform and entertain us are in a fierce competition for our time and attention. Social Media, Blogs, Websites, TV, Radio, Email and many more. If Facebook wants to keep growing and dominating the social media space in the future, it has to keep changing by listening, analyzing our behaviour and anticipating our next move. Facebook is facing more pressures that are a byproduct of dominating the social media landscape. The network has become the primary source for news for a large part of the population, at least in North America. The more we discover about how this phenomenon can be exploited the clearer it becomes that Facebook is, in fact, a “media company.” This distinction comes with responsibilities that the social network is not set up to meet. Facebook needs to get out of the “news game” if it wants to avoid government regulation. Facebook can’t reasonably be blamed for having been used by foreign powers to influence the 2016 US election and others. However, it’s quite clear that it was too easy and profitable to do so. Without the editorial tools of a media company, Facebook can only make it harder for these attacks to occur and simply show us less news. Unfortunately, this will also limit our exposure to real journalism. Facebook’s revenue model is based on advertising income. Just as Catester said in her soundbite advertising, in general, is becoming less and less desirable and is under immense pressure to change. The fact that Facebook is going to limit the amount of brand content we see also means that the total amount of Facebook ads is more limited, making a rise in price inevitable. Before we look into the future, I have to point out that we have seen gradual changes in the Facebook algorithm leading up to this for a while. The organic reach of Facebook posts overall has declined to 6% of people that liked the page for a while now. Pages that enjoy more engagement than average have enjoyed more organic reach, however. I will explain later in this article why I think this will continue. Many social media experts have voiced their predictions on how the changes are going to affect business pages. At this point all of this is speculation. The only clear signal from Mr .Zuckerberg’s post is that “Community” is going to be the new focus. If you, like me, manage a Facebook page for a small business or an organization you might be in a much better position to benefit (!) from this change. Treating your Facebook following like a community should be a lot easier for us than for larger brands. Your connection to your fans is likely much more personal than that of a brand that built their following with deep marketing pockets. You can continue to “post and run” boring, self-serving content on your page that only talks about your business and has no value to the user beyond telling us what we can buy. Pages like this are ineffective now and will become obsolete shortly. Your ad budget will need to increase significantly. You can post more engaging and entertaining content. Most of the pages I manage as well as those of my best students have seen higher organic reach than the average pages on Facebook before. This is because the content we post is rarely sales related and creates engagement. It’s not about you! The primary purpose of your social media presence is NOT to sell your products and services. It’s to serve your (potential) customers. For social media to be effective, you will have to spend more time engaging with your audience. Many marketers have already switched their main focus to groups. Depending on your business and your talents, this can be a very effective way of building a community. Beware that running an effective community requires a significantly higher amount of time and attention than serving a public page. Beware that Facebook groups are going to be the social media marketer’s weapon of choice and we will see significant growth in the number of groups vying for our attention. Facebook has invested heavily in video for a few years now. Aside from taking market share away from YouTube, Facebook has also realized that video is becoming more popular, especially since mobile technology improved. Live video enjoys more engagement right now but I have a feeling that we might see a decline in viewer numbers once live video becomes more common. Live video is great; it brings us closer to our community in a very efficient way. However, it also requires a lot more time for me as a user to get the same amount of entertainment and information than in an edited piece of content. If we can harness the power of this new technology, it can have the potential to serve our customers in whole new ways. The danger to misuse this power for spamming those that opt into these bots is large. Those that manage to use them well will have a better chance to benefit in the long term. 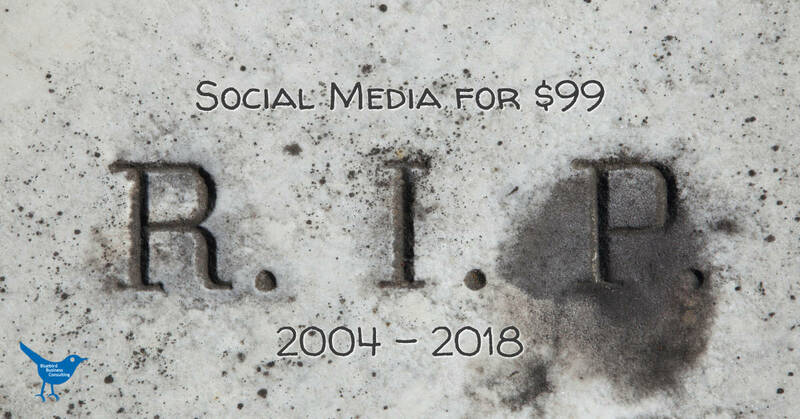 This is the end of social media marketing as we know it! And that’s a good thing! Especially because I focus on small business pages in my work I see a lot of pages that see Social Media as a pure marketing channel. These business owners measure their success by “direct new sales”, “clicks to a website or offer”, “likes”…. Many Facebook pages are a wasteland of self-absorbed posts that nobody sees. Some don’t even answer direct questions from users in any way. Getting results from your Facebook page will require more work, a more active presence and a willingness to serve your community. Considering that a huge percentage of your customers are regular users of Facebook the potential to serve them where they hang out is huge. I encourage you to take up the challenge and actively build your community! There are a few things we can do to improve our chances to actually end up in email inboxes. Creating value rather than chasing the next sale would be one of them. In my interview with Nicole St. Germain from ConvertKit, we went through a few more tips. But the number one factor for getting your emails opened is the right subject line. With so many emails, your email inbox looks like a result of a google search. 121 emails are to be prioritized into “Open right away” “Maybe later” and “Delete.” Obviously, we want our email to be in the first category. As in the Google search, an effective headline is key to getting the email opened. You simply type your subject line in the tester and immediately receive a score and a whole number of helpful improvement suggestions. As you can see my original subject line: “This is a great tool to get your email opened” received only a “B” because it’s not easily scannable, had a negative sentiment (?) and included the word “get” often associated with spam emails. “An awesome tool to make people read your email” received an “A” score. It’s still not top in “scannability,” but it doesn’t include any spam words and is written on a 5th-grade level (lower is better 😉). I invite you to try it and let me know if you see any change! I hope you had a restful holiday break and can start 2018 recharged and ready to reach your goals! 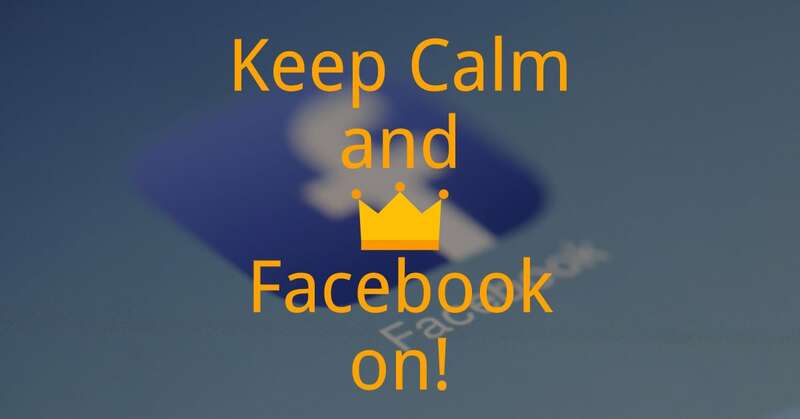 Let’s begin with taking charge of your Facebook feed. We are so used to feeling helpless against Facebook’s constant changes that many of us have given up and just take everything we are given. Ads are often a point of complaint. We seem to see too many ads, the wrong ads…. Some are creeped out by overt re-marketing ads. On the flip side, Facebook ads give us business owners a great opportunity to reach future customers in a very targeted manner. Facebook ads are still one of the cheapest ways to deliver advertising online or offline. The problem is, the amount of advertising we accept as Facebook users has reached its maximum. This means that more ads are competing for space in our stream. Few business owners know that the quality of their ads, the timing and the targeting of ads influences how many people see our ad. A Facebook ad that gets accepted in the stream reaches more users for less money. As Facebook users, we have the power to select the ads we don’t want to see anymore. For me, this often happens if I see the same ad too often. On the advertiser side, this negative signal reduces the relevance score, and the ad gets shown to fewer users. We are not helpless victims! Let’s make 2018 the year we use the power we have. I don’t know if you know me well enough yet to know that I can get pretty excited about little things like a new tool to engage my website visitors. This morning I received a Facebook message (I really have to tell my Android phone not to wake me with messages) from Stephanie Blake from Social Sparrow. I had subscribed to her Facebook messenger bot a while ago. Stephanie’s agency provides technology based marketing solutions to their clients. From building a strategy to Facebook ads to measuring results, Social Sparrow’s focus is on providing the maximum ROI (Return on Investment) to their clients. As a team that is up to date on the newest developments, Stephanie and her team are experts in using Facebook messenger bots. Like anything that is new, messenger bots show amazing results. Apparently open rates for messages are around 90% – not bad compared to an average email open rate of 20 – 30%. But I don’t want to bore you with a rant about spamming and misusing your audience. I am confident that those that use these tools wisely will win over those that only sell, sell, sell all the time. At least in the long run. The other development you may have noticed is that more and more websites feature a little chat window in the corner that encourages us to contact the website team with questions or inquiries. My experience with these as a website administrator is that they can dramatically increase contact requests and leads from a website. As a user I must say that my experience is between being blown away by great customer service and disappointment that nobody was there to answer my question and I was put into an email queue. Granted, in most cases I did receive an answer by email fairly soon after. I had one of these chat options on my website before but took it off because it wasn’t used enough and slowed down my site. The other problem is that I can’t be monitoring my site 24/7 and I don’t have an international team to back me up. I’m also a little afraid to add a whole bunch of emails to my daily workload. What Stephanie introduced me to is different though. This chat tool is linked to my Facebook Messenger account. I use Messenger more and more and have it installed on my phone. For me it’s much more convenient to answer a message than to log into my website and answer an inquiry there or by email. And it’s more likely that my reply gets seen immediately. Stephanie wrote a short article about how to install this and you can find it here: http://mysocialsparrow.com/facebooks-customer-chat… In my case the video instructions didn’t quite work on her site so I watched the video on her Facebook Page. What do you think? Is this a good way to use a Messenger bot? Register for Stephanie’s course at Botboss.io . I’m looking forward to learning more about messenger bots. Picking the right name for your blog, your website or even your business can be a hard decision. And it’s a decision that will last for years and is hard to correct if it goes wrong. The advice on what name to choose for your website address is changing as we users change our habits and what we accept. During the development of my upcoming online course “How to Build Your Own Website” course I came across this question and realized that I needed to touch base with an expert that is knowleadgable about domains and can help us figure out how to find the right answer. Andy Mcilwain works on the content marketing team at GoDaddy, primarily working on the GoDaddy blog. Prior to GoDaddy Andy worked in-house and at agencies in roles covering front-end development and content production. On the side he is a longtime organizer of a local WordPress meetup group, also does intro-level WordPress/web training for small businesses. Andy lives in Toronto, Canada. I invite you to listen to this episode of the BlueBird Podcast, and I would be thrilled if you let me know your thoughts in the comments. Getting that visibility on the Google SERPs (Search Engine Results Pages) means the difference between the phone ringing, and not so much. That much becomes obvious after a short time serving a local market, but the everlasting question is: How can I rank in Google? Enter SEO. The field of “Search Engine Optimization”, which has grown to unprecedented levels in recent years, largely due to the immense value that can be attributed to search engine traffic (as well as the rising costs of advertising directly with Search Engines, i.e. Google Adwords). Most business owners go to the services of SEO or Internet Marketing agencies to help improve their Search Engine rankings and traffic. However not everyone is in the position to take on the services of an agency (the quality ones, i.e. the ones that deliver results, can be pricey), so they can attempt to handle it themselves. While not easy, it’s certainly possible. And that’s about it. That’s the limit to most peoples (well-meaning) advice. But there is a lot more that business owners can do. This article will go over some common tactics that business owners can take advantage of to benefit their SEO initiatives. But first, let’s go over some SEO fundamentals to make sure we are all on the same page. Crawling and indexing – Search Engines consume your site by “crawling” it, i.e. loading pages like a user might, and following “links” throughout your site to all your content. Once it has crawled the pages, it can choose to include them in the “Index”, i.e. it will become searchable on Google.com/Bing.com/etc. If you are using WordPress and have your pages linked via a navigation menu, chances are you will be fine in terms of crawling and indexing. Images with proper alt text. Outbound links to relevant resources. Off-Page Ranking Factors – This is where Yoast can’t help you. Off-page ranking factors generally come in the form of “backlinks”, i.e. a 3rd party website that is linking to your website. Think of backlinks as a “vote” for the relevance, authority and/or trust of your website/webpage. While on-page factors tell Google what you think about the page, backlinks tell Google what an impartial 3rd party thinks about that page. This is how Google separates the mediocre from the good, and the good from the great (and ranks them accordingly). So, what can a solo business owner do, besides writing title tags and meta descriptions, to help improve their SEO? Let’s take a look! Vendor Lists – Do your partners/vendors have a place where they list their reputable vendors or dealers? Get listed, along with a nice, do-follow backlink, and if possible your Name, Address, and Telephone Number. Blog Posts – Being in the same industry you probably have some helpful insights that could be put together in a blog post. Pitch a few topics to your partners and see if they take you up on it. You’d be surprised how many people are eager for quality content. Reciprocal Links – Old school, but still worth it. Get listed on your partners “Links” pages, and chances are they will ask the same from you. Albeit this isn’t the most creative approach (blog posts are better), but take what you can get. Reviews – Reviews can really help your Google My Business rankings (but not your organic rankings). Reach out to your partners to get them to say a kind word. A lot of what SEO’s call “white-hat link building” is just a nerdy word for “getting press coverage”. Stop thinking about websites and HTML code for a sec, and just think about what it takes for a small local news outlet to cover a story. They aren’t swimming in content opportunities, so are always open to pitches. They also aren’t into advertorials promoting your company for no good reason. This is where a local event makes a lot of sense. Whether it’s industry-specific (networking events, for instance), location specific (block parties or neighborhood events), or for a good cause (fundraising for charities), these are all newsworthy events that can get picked up in local newspapers. Now, don’t go crazy and spend time and money on organizing an event to just get links. You should be looking to leverage it for all types of benefits, like networking, fundraising for charity, building a good rapport with your community, AND on top of all that you get links from local newspapers that will help you crush it in the SERPs. Be sure to prospect out all your link opportunities and send them a pitch way beforehand. Journalists and bloggers will love to get the inside scoop ahead of time. After that, you can leverage the news for a press release, which has some moderate SEO impact as well. Being a real company has some advantages over the standard SEO spammer. You can get listed among other real companies on very relevant industry associations and organizations. From the generic Better Business Bureau to the very specific associations (both local and national), these are all great exposure and link opportunities for your website. Some might come with a hefty cost, but most hover around $300 a year or so. I would recommend leveraging them for more than just your backlinks. Just like the events above, make sure to squeeze whatever benefits you can out of these memberships, including networking opportunities and “social proof” (i.e. : BBB Accredited badge on your website). As a business owner, you have the experience and knowledge that is valuable to other people in your industry. Get a few writing samples published online (use your own blog and/or ask your partners to publish articles of yours on their sites). This gives you proof that you are a “published author”. Approach owners of sites with a friendly and honest pitch to write for them, for free. This can end up being as simple as a few “guest posts” on blogs (which are an effective link building method), all the way to a regular contributor to local newspapers (I have a lawyer friend who did this for years, writing a legal column for the local newspaper). This strategy sounds great, and it is, but it’s also a lot of work. Writing articles that are well thought out and provide real value takes time and significant effort. However, once you’ve done it, it pays off for long after it’s been published (both from the link value and from the exposure you get as an industry expert). Of course, if you have knowledgeable people on your staff, you can always attempt to delegate this. However, make sure you are willing to put your name on anything they write. SEO can be frustrating and confusing, even for the most experienced marketers. However, if you face it with some fundamentals in place and the right mindset, you can make headway, especially in local niches (which are generally lower competition). However, you will make absolutely ZERO progress if you don’t take any action. So, if you remember just one thing from this post, it’s that you should shake off whatever is keeping you from taking immediate action and JUST DO IT. Whether you “succeed” or “fail” is irrelevant, you will have learned something about your situation and strategy, and you can’t put a price on that kind of experience.